The most important thing for us here at TOTC isn’t comics or pop culture or any of our hobbies, it’s our community. After all, none of us would be where we are today without the support of our communities through our lives. So when we heard about the Verde Valley Comic Expo we were absolutely ecstatic. This was after all, a place for comic creators of all types locally and abroad to come together, and it was happening in our own backyard no less. The TOTC team hit the local street this past Saturday in full colors to see what it was all about. 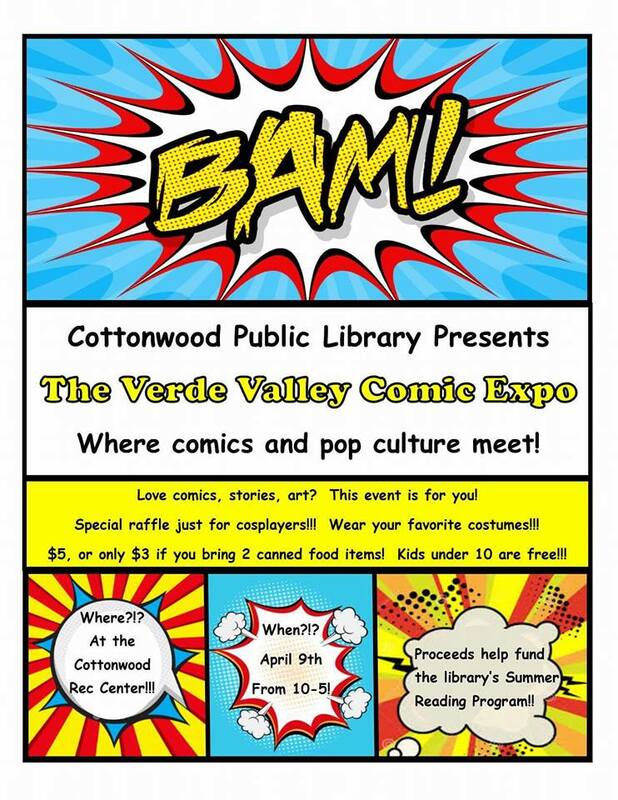 Organized and ran by locals almost entirely, The Verde Valley Comic Expo ended up being something of a hit in Cottonwood. Three hundred and ten total guests were in attendance including the six of us, and I only really count as half of a person! There were fans of all ages and levels of involvement there, from kids brought by their parents to see cosplayers to die hard comic fans eagerly picking through cardboard longboxes. Getting to be right at the ground level of this kind of engagement and excitement here locally was sort of amazing. It’s one thing to stand in a big convention like Phoenix, but it’s another to see how this small little group from last year managed to pull in a three hundred guests this year. I wouldn’t have ever imagined running into someone like Michael Gallagher (famous for his work for MAD and on Sonic the Hedgehog) or Jim Hanna out here on the frontier. Then there’s us, a bunch of grimy and dirty punks and nerds getting to be journalists! The froth was alive in the hall of the cottonwood Rec center, densely packed from wall to wall with artist booths and people from all over the valley and the Midwest. I don’t know how the Jan “The Janimal” Quisumbing and Dave Beaty managed to set up such a smooth event, but we want to give a huge shout out to them. Some of us at TOTC have covered events around Arizona for half a decade now, if not longer, and few have gone as swimmingly as Verde Valley Comic Expo did. It was really the kind of place that you’d feel welcome at whether you were a super-fan, a creator yourself, or just someone who wanted to look at some talented artists creations and talk to other people who like comics. We have so many interesting stories even from our humble little comic expo that we’re excited to share. Everyone at a convention really does have a story to tell, from artists to writers to fans. You can bet Tales of the Con will be there to find out what they are. Be sure to check out our photos from the event.